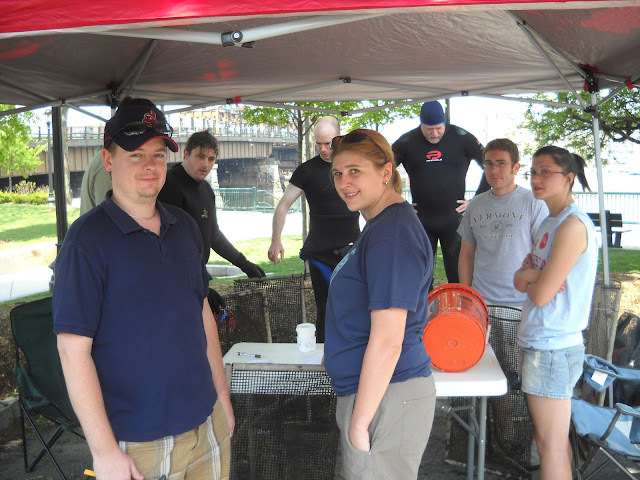 A great group of volunteers assembled sunday to check on the oysters for the first time in 2010. We brought up 4 of the cages with known numbers of oysters placed last fall. We also pulled up random cages to make many measurements of growth. The survival in the cages was very good. Only about 5% of the oysters died over the winter which is very favorable. 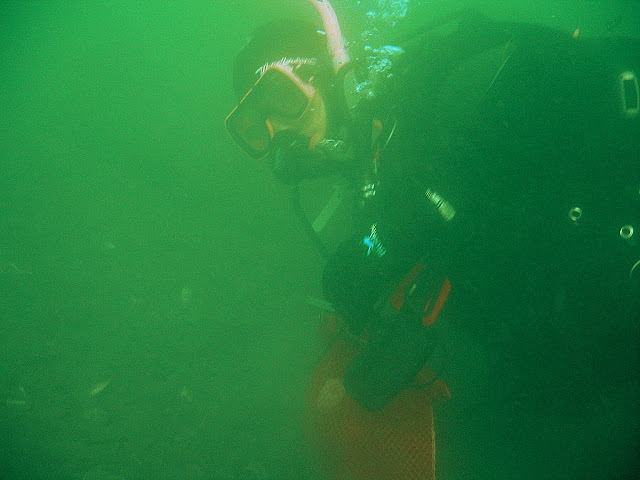 Underwater, the dive team looked for signs of silting, which was minimal. Many of the loose oysters were being killed by predators however. Below is a picture of a crab eating an oyster. One interesting thing we saw was that some of the oysters had developed an imprint of the cage mesh on their shells. Several of the cages have temperature data loggers in them that we removed and downloaded. We will share all of our data soon! Special thanks to Rich for running the last set of oysters back over to the north when the rest of us had called it a day! In June we will do more monitoring work so please check back for more information soon as we settle on a date for that event! We hope to pull up more cages and will need plenty of volunteers to help measure and count oysters.